Fog Scents - Make your fog smell great! Make your fog smell great with American DJ Fog Scent Juice now available in Apple, Tropical, Strawberry, Peach, Rum, Musk, Lemon, Vanilla. 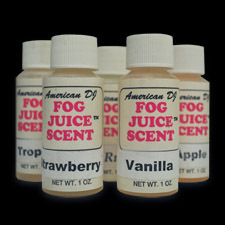 Simply pour a 1 ounce bottle of Fog Juice Scent to a gallon of fog juice. Made from water base materials.